Plenty of RAM and hard drive space make the Dell Inspiron 15R N5010 a good option for anyone who wants a notebook that can also be used as a desktop replacement computer. However, its build quality could be better, as we noticed some annoying creaking in its base, and its screen suffered from shimmering when viewed from certain angles. Dell's Inspiron 15R N5010 is a 15in notebook with an appealing design and a well rounded configuration. This Dell notebook weighs 2.6kg and is aimed at users who want something that can be comfortably used on their lap, as well as act as a replacement for a desktop replacement. 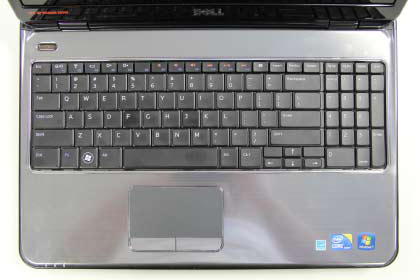 New model: Read our review of the ivy Bridge-based 2012 model Dell Inspiron 15R 5520. The Inspiron 15R N5010 runs an Intel Core i5-430M CPU with two cores, Hyper-Threading and a clock speed of 2.26GHz, but the most impressive specifications are the notebook's 6GB of DDR3 SDRAM and 640GB Western Digital Scorpio Blue hard drive. This is more RAM and hard drive space than we're used to seeing in a mid-range notebook, and it gives the Inspiron 15R N5010 excellent multitasking abilities as well as lots of head-room for image manipulation and other memory-intensive tasks. It runs Windows 7 Home Premium 64-bit edition, so all the memory is available. 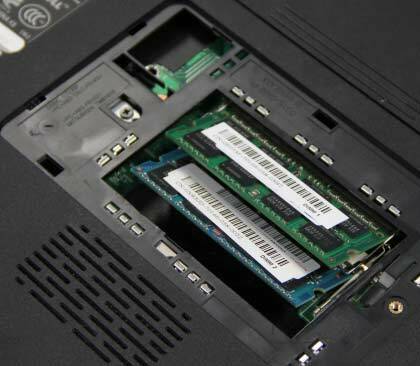 The Inspiron 15R N5010 has two memory slots. Our model was furnished with one 4GB module and one 2GB module. Performance tests showed the Inspiron 15R N5010's speed to be adequate for office and multimedia pursuits. Its 2.27GHz frequency is the lowest of all the available Core i5 CPUs (except for the low-voltage models), but the difference between 2.26GHz, 2.4GHz and 2.53GHz will be negligible in real-world tasks. In our Blender 3D test, the Inspiron 15R N5010 recorded a time of 60sec, which is only 5sec slower than the Dell Vostro 3700 and Samsung R580, both of which use the 2.4GHz Core i5-520M CPU. Its iTunes MP3 encoding time was 4sec slower than the Vostro 3700. You won't really lose too much time when performing everyday encoding tasks, and even more taxing tasks such as DVD ripping will be accomplished in reasonably good time. It took us 1hr 10min to compress our test DVD to a 1.5GB Xvid file, which is only 5min slower than a high end laptop such as Fujitsu's LifeBook E780, which runs an Intel Core i7-620M. Graphics performance out of the installed ATI Mobility Radeon HD 5470 adapter is only middle of the road; it recorded a score of 4572 in 3DMark06. It's a low score for a 15in laptop with a $1500 price tag — even the Samsung R580 recorded a quicker score of 7412 in the same test with a GeForce GT 330M graphics adapter. Nevertheless, it's more than enough graphics performance for HD video processing and it will even be able to run some older games. The hard drive recorded a fast transfer rate of 29 megabytes per second, thanks in part to its high density. Once it gets substantially filled with files, that figure will drop slightly. We're not fans of the way Dell has partitioned the large drive, leaving only 60GB free for the operating system and applications on the primary partition. We had only 20GB free after installing our benchmarking software. The Inspiron 15R N5010 comes with a roomy keyboard that has firm yet easy to press buttons. It's not tiring to type on it for long periods of time, but the keys do make a hollow thud when you hit them. A number pad is located on the right side of the keyboard, and although it's a little squished, it comes in handy if you regularly use the calculator. The Function keys are reversed (like the ones we've seen on HP's Mini 5101 notebook) and this allows you to change brightness, volume and other tasks without having to first press the Fn button. If you're used to hitting F5 to refresh your Web browser, you'll have to remember to hold down Fn as well. The touchpad is large, the keyboard feels good to type on and the design of the unit is nice and clean. A large touchpad allows you to perform various gestures with two fingers: it supports two-finger scrolling, pinching and rotating. You can also set it up so that you can use one finger circular scrolling (a.k.a ChiralMotion scrolling). The left- and right-click buttons are soft and don't make a sound when you press them — we love that. There aren't any extra buttons above the keyboard; you'll only find the power button. The palm rest has a brushed design and it looks good. It's very smooth though and could become sticky and uncomfortable to use during hot weather. Sparseness in the design is also evident when you look at all four sides of the base. The ports and slots are well spaced all around the base, including on the spine, instead of being mainly crammed on side. The front has nothing but two speakers, which are reasonably loud and emit great sound for movies and music. The right side has a built-in DVD burner, an eSATA port, a 10/100 Ethernet port and an SD card slot; the left side has a USB port, microphone and headphone ports and an HDMI port; the rear has two more USB 2.0 ports, a VGA port and the power connection. We found the body of the Inspiron 15R N5010 to be a little creaky, especially on the left side. In this area, the palm rest cover also made a ticking sound when slight pressure was applied to it, and this was very annoying. We think it has something to do with the palm rest brushing up against the heat sink. This works in conjunction with a fan to extract the heat generated by the system, and the fan makes a loud whirr when the CPU is under load. There are also vents on the base of the system and overall we found the Inspiron 15R N5010 to run cool, without much heat coming through the base. The screen is 15.6 inches and it has a native resolution of 1366x768. It sits about two centimetres in from the spine, which gives the notebook good balance and a slightly different look to the norm. It has a red lid and a black bezel and these colours match nicely with the silver palm rest. There's a webcam located above the screen, directly in the centre, and it's accompanied by a built-in microphone. The bezel and the screen are very glossy though, and reflections can be distracting while you work. In dark environments, we noticed a shimmering in the screen when looking at white backgrounds while the screen was leaned back just past 90 degrees. The shimmering was not noticeable when the screen leaned forward. The Inspiron 15R N5010 has a 48 Watt-hour battery installed on its spine and it lasted 2hr 20min in our video rundown test. In this test, we disable power management, turn up the brightness and enable the wireless radio. This is a decent time for a Core i5-based 15.6in notebook and you'll be able to get even more life out of it if you use a power management plan and lower brightness. While we aren't too impressed with the Inspiron 15R N5010's build quality and screen, its specifications make it a good option for anyone who wants a mobile desktop replacement system. It has plenty of RAM and hard drive space and it's also very comfortable to use.